Tasmanian Devil: it’s just my bitchy resting face, I’m cute when I smile! Everyone loves the Tasmanian Devil. They’re the Lions of Tasmania: great to watch from a distance but don’t put your fingers near them! Some scientists are talking about changing their names to Australian Devil so they can bring them onto the mainland. Apparently, they jumped ship 400 years ago. They have had a hard time of it of late, because of the face tumour you’ve no doubt heard about. It’s not solved and we need your help to try and get a smile back on their angry little faces. Tasmania. What else did you expect? Even though their numbers have gone down since early 1990s, the devil still roams across most of Tasmania from the coast to the mountains. They are almost anywhere they can hide and find shelter by day, and find food at night. Tasmanian Devils are the largest living meat-eating marsupial (have a pouch) in Australia. They stand about 30 centimetres tall and weigh up to 14 kilograms. The head and neck can take up about a quarter of their weight because they need those powerful jaws to crunch through bones. The Tasmanian Devil mainly scavenges for food – rarely do they bother hunting. They'll eat lizards, frogs and insects, in fact almost any animal protein they can find. Being a scavenger is a great thing for the ecosystem as they clean up sick and dead animals. They probably also help to control feral cats in Tasmania and, by doing so, they help to protect some of our other native animals, particularly birds, bandicoots and quolls. Devil mothers are pregnant for about 21 days. The mother can give birth to 20-40 young, which are each about the size of a grain of rice. However, she has only four teats in her pouch, so it is a race to the pouch, with the first four winning a chance at survival, and only two usually making it out of the pouch. The joeys are kept in a simple den for 10 months and the mother puts a lot of effort into looking after them. There was once a bounty on their heads—in the early 1900s—because they ate everyone’s chickens. In 1830 the Van Diemen's Land Company put up a reward for every devil killed on their property. The reward was two shillings and sixpence (25 cents) for a male devil and three shillings and sixpence (35 cents) for a female. It was only in 1941 that laws protected the devils. It actually is a tumour. 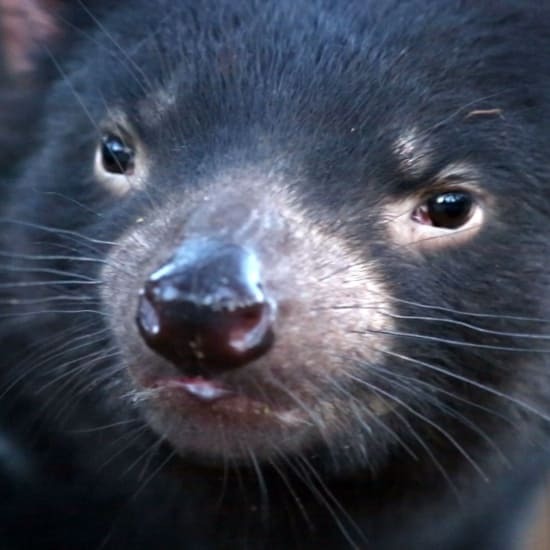 The Tasmanian Devil could be extinct in the wild in 20 years unless we knock the Devil facial tumour disease on the head. They also need more areas of habitat fenced off and restored. And we need to somehow stop them getting killed on the road – because this is where they often go to feed on dead animals. We want them to remain as the top predator in Tasmania to help balance the ecology. We want them to thrive and survive in the wild. We want them to be free of cancer. We are working hard to ensure their old and new homes in the wild are ready. Greening Australia are tackling this one, working closely with scientists and landholders. The scientists are studying the devils to understand where and how big their new homes need to be. The landholders are taking areas out of agricultural production to enable the new homes to be built. Greening Australia has been working on this for over 10 years in the midlands of Tasmania and has restored over 1,000 hectares of critical habitat so far. Donate directly to Greening Australia.